With 12 Days on the clock, you can't afford to miss a beat. Or miss the European Highlights. The perfect loop from Paris, it will see you partying in Amsterdam one moment and driving through scenic of Swiss the next. 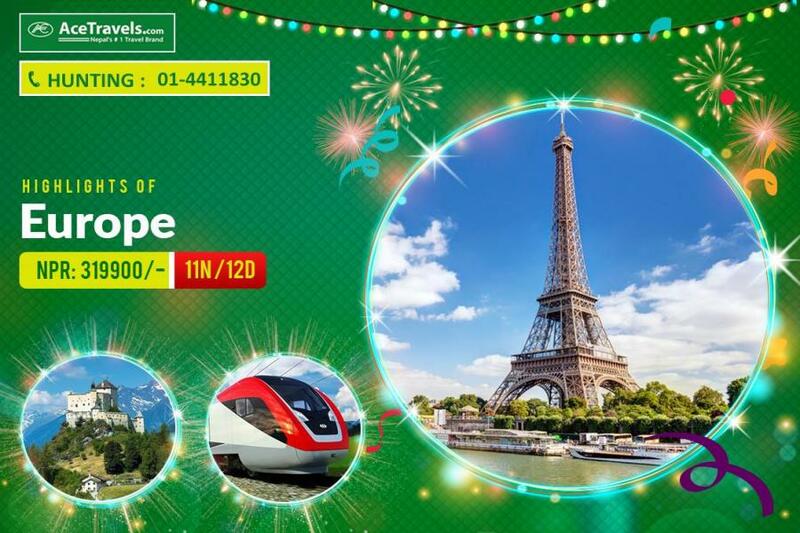 With the perfect combination different Europe destination you will be driven from Eiffel tower to Atonium, you will be amazed with the history of Germany on the way to Swiss Alps. Finally the beauty of Mt. Titlis & Ancient history of Venice will amaze you. Finally you will end your tour with good memories. Breakfast at Hotel. Today morning we will proceed to Half Day Guided Panoramic City Tour of Paris. This excursion will enable you to discover Paris from three different viewpoints. The first being a one and a half hour drive in the City. Second is a Boat Cruise down the Seine (Admission Included), taking you back through 2000 years of Parisian history. Finally the third is an elevator ride up to the 2nd Floor of the Eiffel Tower (Admission Included), for a breathtaking panoramic view. The excursion will end at the Eiffel Tower. Later there will be time for shopping. Evening transfer for Dinner at Restaurant. Overnight at Hotel. Breakfast at Hotel. Proceed for a Guided Tour of the Palace and Gardens of Versailles (Admission Included). The Palace of Versailles covers an area of over 721,000 square feet and has more than 700 rooms. Follow your guide straight to the front of the line to see the palace's most beautiful rooms: the King's Grand Apartments, with seven rooms each dedicated to a different god (Apollo, Mars, Mercy, Venus, etc.) and the Queen's Grand Apartments, mirroring those of the king, including the Coronation Room and the Queen's Bedroom. Also, admire the spectacular Hall of Mirrors, a unique room in which guests were received and impressed. Enjoy your free time strolling through the Gardens of Versailles and admire the 386 works of art (including more than 200 statues), fountains, ponds, flower beds, and trees. During the Summer months, a range of activities are organised, such as the Grandes Eaux Musicales, when the fountains are made to dance to music. Overnight at Hotel. Breakfast at Hotel. Today morning we will proceed to Half Day Guided Panoramic City Tour of Amsterdam. Past and present, Trade and Leisure, Religion and coffee shops, diamonds and beer, all flourish together in splendid Amsterdam. On this extensive Bus Excursion, we will show you the whole variety of impressions Amsterdam has to offer. From the Monuments in the Center, you will be led to life in the latest Quarters, designed for the future, with a blink to the past. A picture stop at a Windmill and in the area of Modern Architecture is included. The Diamond Factory commemorates Amsterdam's wealthy past. Also included within the City tour is a Canal Cruise (Admission Included). Later Visit Madurodam (Admission Included). Overnight at Hotel. Breakfast at Hotel. Today morning we will proceed to Frankfurt via visit to Cologne. Arrive & proceed to Half day Guided tour Frankfurt. Frankfurt, a central German city on the river Main, is a major financial hub that's home to the European Central Bank. It's the birthplace of famed writer Johann Wolfgang von Goethe, whose former home is now the Goethe House Museum. Like much of the city, it was damaged during World War II and later rebuilt. Evening transfer for Dinner at Restaurant. Later transfer to your Hotel. Check into Hotel. Overnight at Goethe Hotel & Restaurant Messe (Tourist Class Hotel) or similar. Breakfast at Hotel. Today morning we will proceed to Venice. Arrive & proceed to Half Day Guided Panoramic Walking Tour of Venice. You will proceed to the island by Water Taxi (Included). This interesting tour is centered around the history of St. Mark's Square and its main monuments. We will be visiting the St. Mark's Basilica with its marble and mosaics, and the Ducal Palace where the old Republic of Venice exercised their political and commercial powers in the Doge Palace. Next we will cross the Bridge of Sighs arriving at the famous Venice Jail. You will proceed to the mainland by Water Taxi (Included). Then proceed to Padova. Arrive & transfer for Dinner at Restaurant. Check into Hotel. Overnight at Hotel Casa A Colori (Tourist Class Hotel) or similar.